High quality one inch horizontal aluminum window covering for commercial applications. The Bali Customiser miniblind offers many of the attributes and features of the Classics miniblind , but at a reduced cost. The Customiser is available in the most popular commercial colors and is available with options that are often required in commercial applications. • Headrail: Measures 1" high by 1" deep. Headrail design to include rolled edges at top, light blocking lip at the lower back side and a curved headrail face similar to the crown of a 1" slat. Headrail is phosphate-treated steel and is finished with a vinyl primer and topcoat of polyester-baked enamel and shall measure 0.025" thick. Installation Brackets: Are treated steel with vinyl primer and polyester-baked enamel finish coat to match headrail. The design incorporates a rivet-hinged safety locking front cover. Intermediate support brackets supplied for blinds over 48". 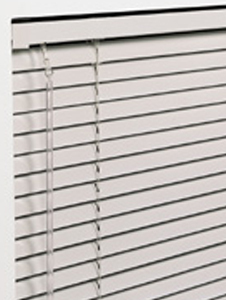 Slats: Made of USA manufactured cold rolled aluminum alloy. Slats are nominally 1" wide and available in standard 0.006" thickness or optional .008". Slats are finished with a polyester-baked enamel with a durable antistatic, antimicrobial paint finish.